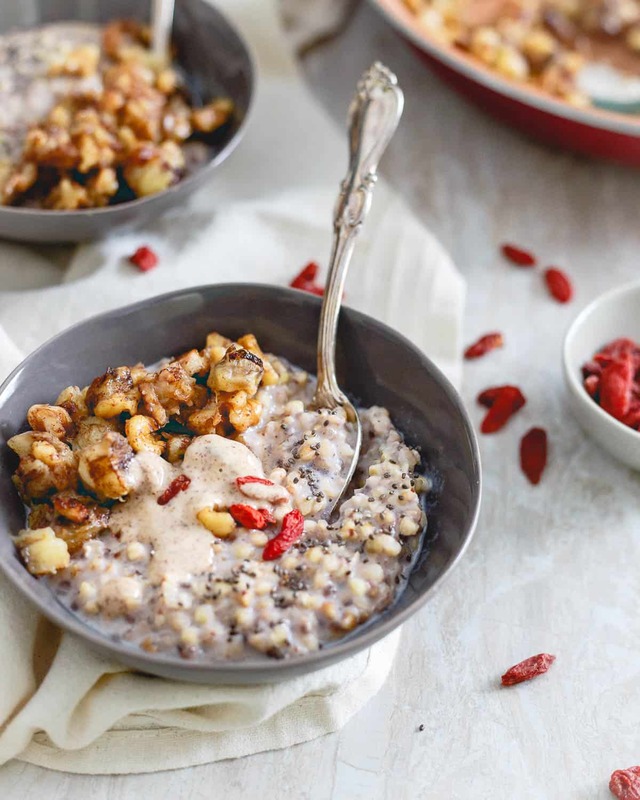 This warm quinoa cereal is topped with a caramelized banana and walnut compote, drizzled in almond butter and garnished with superfoods like goji berries and chia seeds. 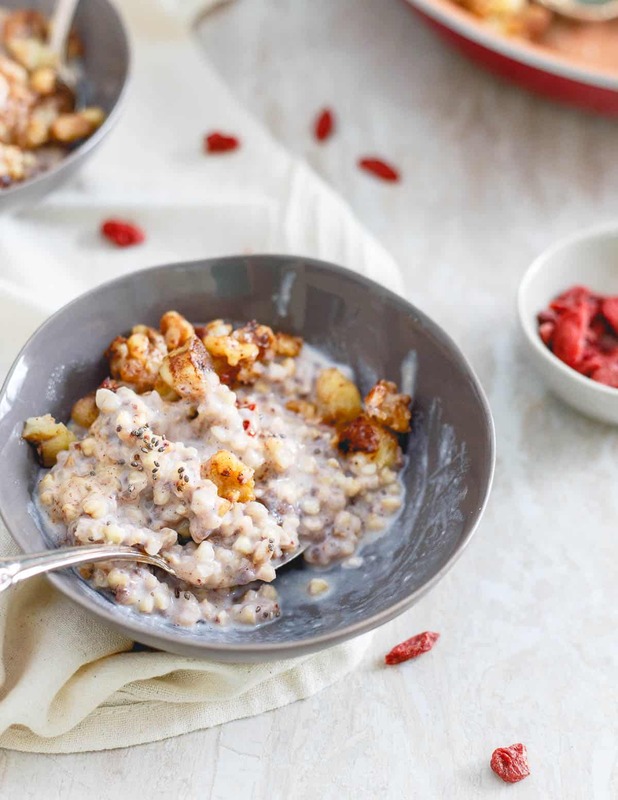 It’s also easily made with buckwheat groats as an alternative (both options in recipe below)! I’m trying not to be bitter. Really, I am. But I guarantee you it’s not working and that I’m uncomfortably sitting (from falling off a chair yesterday while doing sandbag step-ups) on a fully booked plane wishing I was still in my pajamas enjoying this with my cup of coffee on the couch for a lazy Sunday morning breakfast. Today, I’ve been up since 4am and will probably end up pulling a 23-24 hour day because of the time change. I get to attend a cocktail hour in the space needle which I’ve always been too cheap to pay the ridiculous amount of money they want to go to the top every time I’ve been in Seattle. This is barely a “recipe” and more so just one delicious way to enjoy quinoa that you probably haven’t thought of. 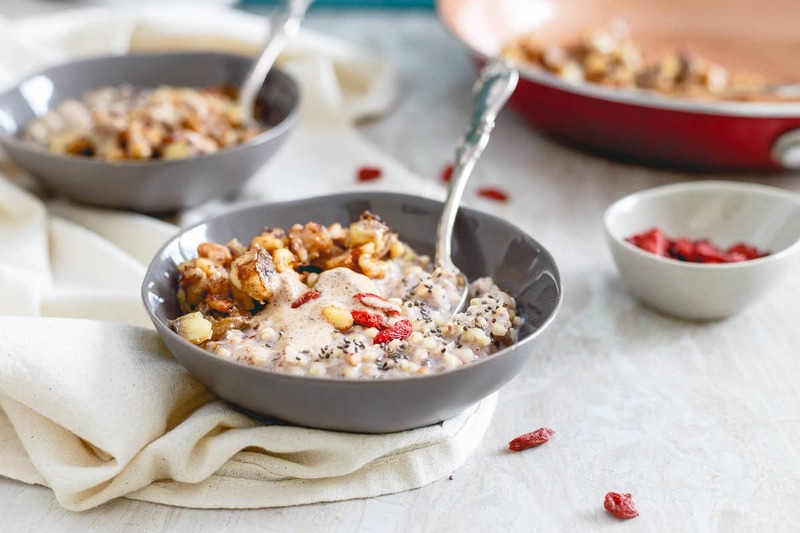 Warmed, with coconut milk and topped with a mixture of caramelized bananas, walnuts and almond butter. Extra taste points for eating it with a little spoon. Don’t worry, the quinoa negates the butter used to caramelize the bananas. Fact. Fair warning though, husbands have been known to eat remaining caramelized banana walnut mixture straight from the pan in the 2 minutes you turn your back (to take pictures). 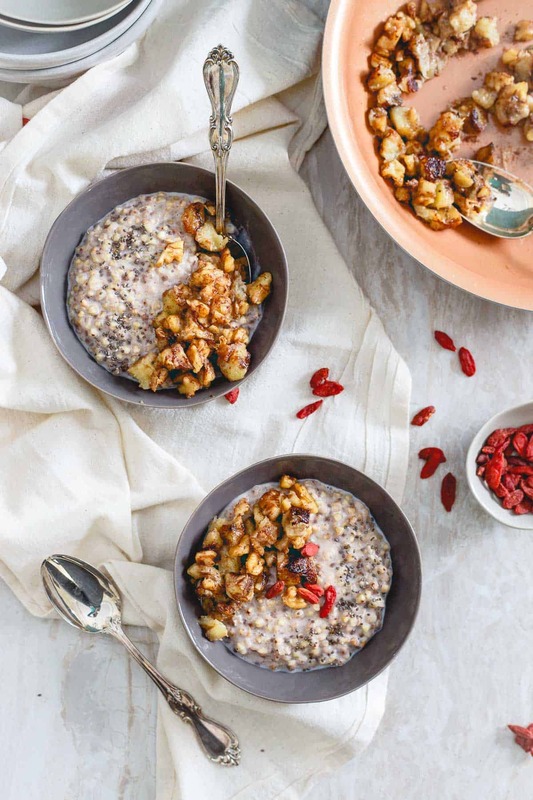 This warm quinoa cereal is topped with caramelized bananas and walnuts. It's a protein powerhouse of a breakfast. There's also an option for using buckwheat instead. Combine bananas, spices, walnuts and agave in a small bowl and toss to coat. In a medium skillet over medium heat, melt butter and add banana walnut mixture. Cook for about 5 minutes, stirring occasionally until bananas start to caramelize. While bananas cook, divide quinoa into two bowls and pour coconut milk on top. Warm in microwave. Add caramelized banana mixture to quinoa and drizzle with almond butter if using. 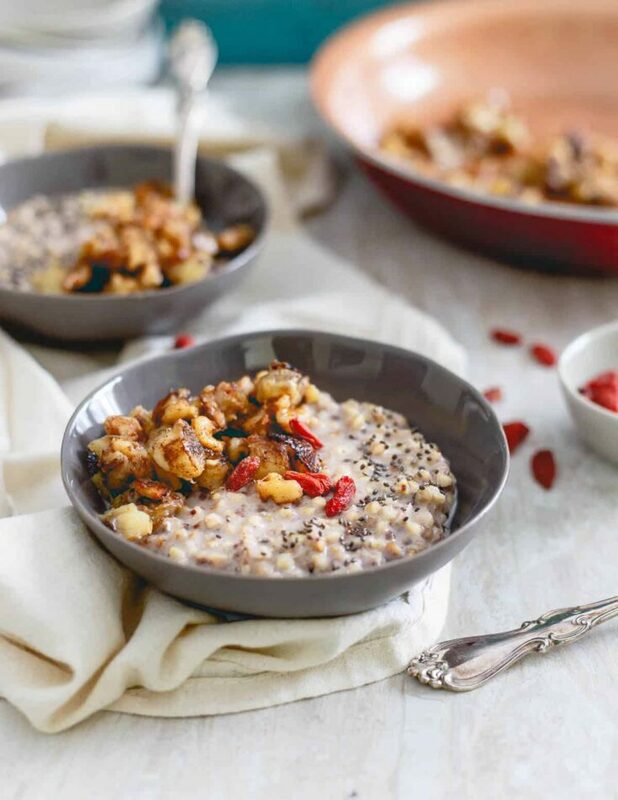 For buckwheat option (shown in pictures): combine 1/2 cup buckwheat groats with 1 cup of any kind of milk/water mixture, 1 tablespoon chia seeds, 1/2 teaspoon of cinnamon, 1/2 teaspoon vanilla extract, pinch of salt and sweetener of choice (maple syrup, liquid stevia, coconut sugar, honey, etc.) in a small pot. Bring to a low boil, stir, reduce heat to low, cover and cook for about 10-12 minutes until most of the liquid has been absorbed. 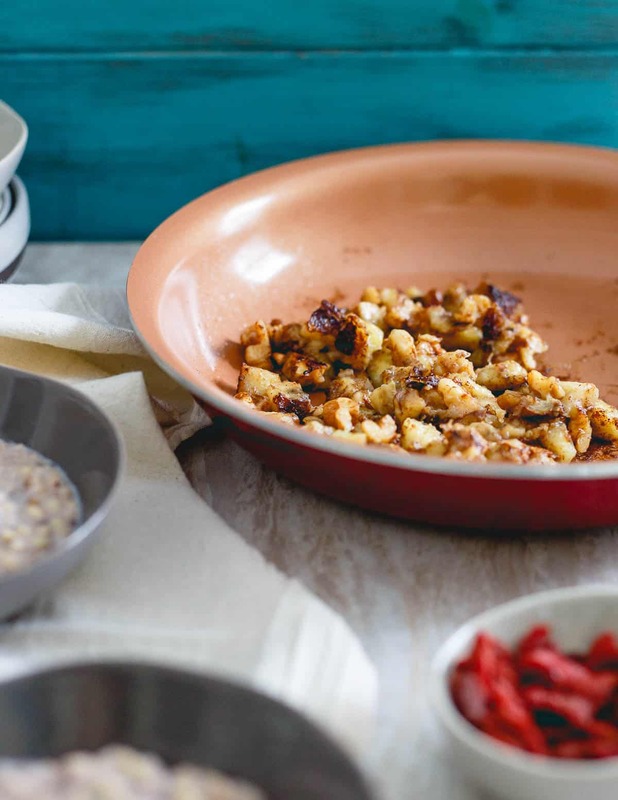 Divide into 2 serving bowls and top with the caramelized banana mixture from the recipe above. oh. my. gosh. That’s it – I have to have this for breakfast some time this week! It looks so good! This sounds heavenly. I’ve been wanting to try quinoa for breakfast for a while now, and I think this is just the recipe to get me to follow through. Totally going to make this for breakfast this week! have a fun trip! And I loveee pan frying bananas, its such an easy way to take a dish up a notch. Lovely breakfast! You know what? We have a lot of quinoa because someone didn’t look in the pantry before going grocery shopping. I have not thought of eating it as an oatmeal. This is indeed perfect for today. Thank you. Have fun in Seattle… Let me know of any good restaurant finds. I do that all the time. You should see the stash of wheatberries I have b/c of that exact reason. Yummy! What a great breakfast!!! I am yet to cook with quinoa, but I have a box begging to be used! This recipe sounds great!! I love caramelized bananas and made some yesterday morning…I think I need to do it again right now! Caramelized anything makes all things wonderful! Enjoy your time in the space needle and let us know if it is worth paying for. I plan to visit the area in the next few years and would love to know if it’s just a rip or something you should just do once to say you have. Ok… so, I was wanting this so bad and made a version of it! Thanks for the inspiration Gina! And yeah – you can’t beat a little spoon. You just can’t. I have a big bowl of cooked quinoa in my fridge (I always make extra — love having it on hand) that I will now be enjoying for breakfast. Thanks! Honestly, I am so sad that my local store stopped selling quinoa. Or else I could make quinoa cereal every single weekend! And on the weekdays, quinoa muffins! Well, I used cooked quinoa and just heated the milk + quinoa in the microwave..wasn’t cooking it in there. Although, cooking it with the coconut milk stove top sounds like a delicious idea too and even more flavorful. Mmmm – I am envisioning those carmalized bananas on so many things…crepes, pancakes, oatmeal. Thanks for the idea. I will be making this. Like, tomorrow. YAY!!! I’m going to have to make some extra quinoa and try this. Love the addition of caramelized bananas! I’ve added them to pancakes before and they are delicious! Quick question… Do you use the coconut milk in a can that might be used for Thai cooking or do you use the big carton of refrigerated coconut milk? Thank you in advance! This looks wonderful! You could honestly use either for this one, I used from a carton but can would work fine too. Just shake it or mix it well first if going that route so the cream/water are well combined. Enjoy! For the coconut milk…is that light or full-fat canned coconut milk? I used carton coconut milk, but either or will work from the can too. Just make sure to stir well if using canned to mix the cream and water together. Love the addition of caramelized bananas! Love the caramelized banana mixture on top Gina. I can see why your husband couldn’t wait! Delicious breakfast! This is the kind of breakfast that I live for! LOVE! Oh yum! This breakfast sounds incredible!